Over here, Tim Keller and The Gospel Coalition are about to launch the New City Catechism. How can we reshape the lives of people who have grown to breath the evangelical air that Packer and Parrett describe above? Since May this year we have been looking through the Westminster Shorter Catechism on Sunday evenings and we are now three quarters of the way through the one hundred and seven questions. During that time I’ve heard comments like, Why are we looking at this again?, and Westminster Shorter Whatichism? 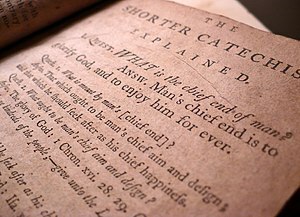 Catechisms are however a great tool for learning the basic Biblical plot-line, Christian doctrine and practice and have been used throughout the last 500 years of the church with both young children and new adult converts. Keller lists a number of reasons why catechesis can be a particularly helpful in understanding better the faith once delivered to the saints, but I particularly like what he says concerning catechising children. Catechesis done with young children helps them think in biblical categories almost as soon as they can reason. Such instruction, one old writer said, is like firewood in a fireplace. Without the fire—the Spirit of God—firewood will not in itself produce a warming flame. But without fuel there can be no fire either, and that is what catechetical instruction provides. I’ve mentioned before that a great way of getting children to know great gospel truths found in the WSC are the 4 Questions with Answers CD’s that are available for download from Songs for Saplings.